Eric Frank Russell: Like Nothing on Earth. A book review by jpoc. 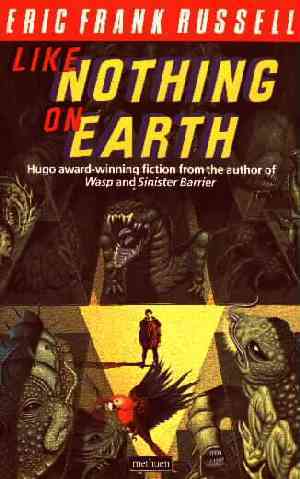 This collection of seven short stories was first published in the seventies though the stories themselves first appeared in "Astounding Science Fiction" magazine in its glory days. The stories are packed full with interesting ideas and they are often very funny. Having said that, it is important to point out also that modern readers will find that the stories themselves have a rather dated feel. The author's novels have stood the test of time far better than have his shorter works. My favourite story from the collection is "Allamagoosa" which projects a "Sgt Bilko" view of military life into a future of interstellar space ships and hyperspace drives. The stories are not all humorous: "Ultima Thule" lands its protagonists in a pretty bleak scenario with no light relief. If you are a fan of period SF, then you may well enjoy this but, if you are new to the author, I'd suggest that you try some of his novels first. "Wasp" and "Three to Conquer" would be a good place to start. Seven out of ten. Still a good read if a little dated. A navy spaceship is scheduled for inspection and, on thecking the inventory against the list, the commander discovers that one item is missing. What is worse, nobody knows what it is. The name, offog is a mystery. What is to be done? Funny, 6/10.